My paper mache elephant project got sidetracked temporarily by an Elizabeth George novel, and I’m now working at my computer because a yellow-jacket got a bit too interested in the paste. (I’ve already been stung twice this week, so I get a little nervous around the little beasts). But all in all, I think the project is coming along nicely. Note – I made a video about this whole process. You can see the YouTube video about How to Make a Paper Mache Elephant here, and download the pattern if you’d like to make an elephant of your own. I purchased some roll ends of paper from our local newspaper office, which allowed me to work quickly while building the bulk of the elephant from crumpled paper. I use a lot of force to compact the wads of paper so they will be a solid support for the paper mache. Then I try to cover as much of the paper as I can with the 2″ wide masking tape. About half of the wire is taped to the elephant’s “spine.” If there was a next time I’d plan ahead and add a block of 1 x 2 lumber at the top of the elephant’s press-board armature so there would be a firm place to attach the tail. A few small nails would hold it firmly in place. Since I didn’t do that, it might be possible for a small child or a rowdy adult to pull the tail from the sculpture, if they really worked at it. Of course, we’ll assume that nobody would want to do such a thing. I decided that it would be too easy to break the trunk if I got clumsy or if the sculpture collided with a ball-chasing 90 lb golden retriever, which is entirely possible considering my ball-throwing aim. So I used some expanded aluminum stuff that I bought years ago for another project. I believe the purpose of the product is to keep leaves out of gutters – but it bends very nicely, and seemed perfect for the elephant. I held the top part of the material to the head with two nails pressed into the paper, and wrapped twine around it to form it tightly around the trunk. Then a layer of paper and paste was put on over the aluminum. Several more layers will be added to make the “skin” very hard and tough. The lower end of the trunk ended up being thicker than I intended, but I think the extra strength is worth it. In a few days I should have all the details like eyes and toes finished, and it should be ready to paint. Stay tuned. Oops – the photo didn’t come through. Were you using your iPhone? If not, the image may be too big. You can make it smaller using this free online tool. Hi Susan. I would love to see your elephant and statue of Liberyy, if you’re willing to share a photo or two. And when you say you dipped material in cement, could you tell us what type of cement, and how you got it to stick to the fabric? Even better, if you happened to take photos while you were making one of your sculptures, would you be interested in writing a guest post for us? I’ve tried a lot of different ways to weatherproof my paper mache, and none of my experiments worked. my mother in law would love this!!! My daughter’s class (5th grade) is doing the play Siddhartha and we are starting to build the elephant tomorrow. I have been reading through the comments trying to make sure we have everything ready to go before we begin (glad I did because I noticed you said you would make the legs farther apart). No one will be riding or sitting on him so we aren’t too concerned with that. Just wondering if you have any last minute sage advice before we begin. I am about to look at your recipe for the paper mache clay, though I think the kids would enjoy putting the strips, which do you think is faster/better? Thank you so much. You are a brilliant artist and if ours turns out anything like yours I will be so happy!! The clay would probably go faster, but with a class-full of kids working on the same project, it would probably be easier to get a similar result on all sides of the elephant if you use the paper strips and paste for the “skin” and just use the paper mache clay for the eyes and other details. However, on something this big I’d probably go with the shop towel and plaster-based paste instead of newspaper and flour paste, just because you could use the entire towel (with hard edges removed) and use just two or maybe three layers. That would cut down considerably on the time it takes to make the elephant. The recipe for the paste is in my mask book, or watch the second video in the Pantalone mask series here to see the recipe and how the paper mache is applied. Be sure to let us see it when it’s done! Oh my goodness! I’m in love with this elephant. Searching now to see what he looks like finished! Hi Lori. I just did a search, and the last post, with video, doesn’t seem to be coming up. Oh well – technology wins again! You can find the complete project video here. My daugther’s middle school theater teacher has asked me if I could make the school a life size elephant for an upcoming Aladdin play. After seeing your video….I said yes!! My husband and I have just completed the frame, making the elephant almost twice the size of yours (5 1/2 feet tall). The student who is playing Aladdin is approx. 85 lbs. and will riding on the elephants back through the auditorium to the stage area. So…my question to you is, since producing your video in 2009 do you have any suggestions as to how we can make this elephant stronger?? I’d hate for the student to sit up there and have the elephant’s sides cave in??? Would you recommend using the paper mache’ paste and if so, how many layers of the regular paper mache would you recommend?? Thank you so much!!! You are so creative and I have so enjoyed cruising through you website! Sherree, the one thing I would do differently if I made another armature for another elephant would be to make the legs farther apart. As she now sits, she tends to tip over if a child tries to climb on her, and she’s so heavy that it could actually hurt a child to have her fall on him. I should have tested the “tippiness” after the armature was built, but before all the paper and paper mache was added. Also, if I made one larger I would use some metal connectors from the hardware store, to make sure the spine piece was firmly attached to the legs. Other than that, if the armature itself seems safe enough for a child, the finished elephant should be even better. 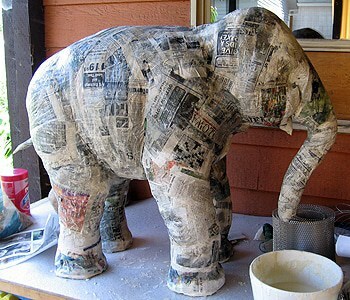 I would probably use the paper mache clay recipe for a new elephant, which is faster to use than paper strips and paste. However, four or five layers of traditional paper mache should be plenty, as long as you don’t expect the sides of the elephant to be kicked too often. You could also use the fast-drying paper mache paste and shop towel method I used for the masks in my new mask book, but use four layers instead of two. That should be really strong. You can find the recipe and how it’s used in the second video about how to make a pantalone mask. The shop towels will cost a lot more than newspapers, though. 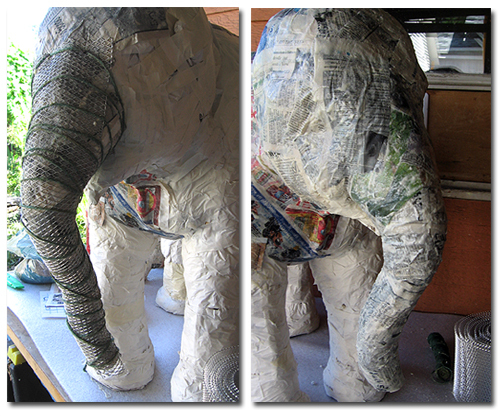 Eleven days later…..Our teenage elephant has it’s first coat of paper mache’ (attached via email) and the theater students are having a blast building the new addition to their upcoming Aladdin Musical! What brings me back to you is after reading your responce again, I wanted to clarify your recommendation and of course ask a few more questions. Were you recommending putting 4-5 layers of paper mache’ then the paper mache’ clay or just using the paper mache’ clay?? 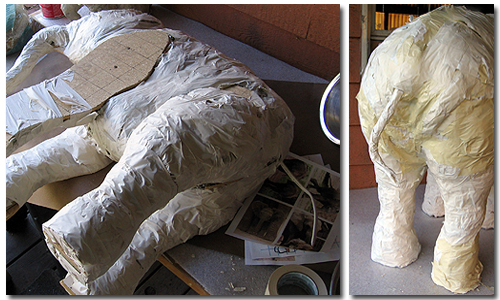 Given the size of our elephant 5 1/2 feet tall and 30″ wide…how much of the clay should I make? How thick of a layer would you recommend and how would attach the ears at this point??? Lastly, given our time restraints, I was thinking of spray painting the elephant with a matte grey then finish him off with a light spray of hammered finish grey spray paint…..any thoughts?? Thank you for the inspiration!! The spray paint would work well. And a clay thickness of 3/8″ to 1/4″ would be plenty thick enough. Make sure the ears are very well anchored before adding any clay to the ears. The best way to make large ears would be to use a metal mesh with 1/4″ holes, and to make both ears (and a connecting strip between them) out of one piece of the metal fabric. Tape the edges of the grid, or pin it through the paper, in a way that allows the paste or clay to go through and adhere to the head. Cover the connecting strip well, and allow it to dry completely before adding any paper mache to the ears. How do you connect the ears. I have a class of 10 and 11 years olds making a smaller version of the elephant. I had one student draw a pattern which all the kids used based on your video. so its not perfect. But we are at the papermache stage and cannot understand how to attach the ears. I have the flexible metal. Do we attach the metal ears to the body before we paper mache the ears? Please advise. Hi Kelly. I’m afraid that part of the process didn’t get explained very well in the video. If at all possible, consider the two ears and the space between the two ears and one continuous piece. In other words, it’s best if you can make a pattern that has the ears on each side with a rectangular piece between them that will go over the back of the head. This gives you a lot of area in contact with the head. Once the mesh is cut, you can use a few short nails or staples to temporarily hold the connecting piece to the head, and then cover it with paper mache. If the ears have already been cut, it will still work. The trick is to attach the ears to the head with those little nails, and then put plenty of paper mache strips all along both inside and outside edges of the ear, using them as “tape” to hold the ear to the head. But only put paper mache on the very bottom edge (the edge that attaches to the head) and leave the rest of the ear uncovered. Allow the paper mache to dry completely, and then cover the rest of the ear. Since the ears are now firmly attached to the head with the dry paper mache, the weight of the wet paper mache won’t pull the ears off the head. It’s best to do it this way even if you do have the connecting strip that wraps around the head, because wet paper mache can get really heavy. I hope this helps. By the way, I put up a special gallery page where people can show off their elephants. If you post photos of the finished elephants in comments on that page, I’ll add the photos to the gallery at the top of the post. thats looks amazing! I have to make a dress out of recycled materials representing deep sea for a school assessment. I have designed my dress and it looks great, but I’m not sure how to make 3D waves come out of the side. Any ideas? We are building a parade float (Noah’s Ark) and though paper mache would be a good form for portraying the animals. We are concerned about the possibility of rain and wondered if rain would ruin the sculptures and if there are any solutions for protecting them against the rain. I would definitely suggest a finish coat to protect the paper mache from rain. If you think the sculptures might be rained on for a long time, then you could be double-safe and use marine varnish. Check the label and make sure you use it in a ventilated room. If the sculptures will only be outside for an hour or so, Verathane or Minwax should keep them dry inside. This is fantastic…i’m so inspired by your blog, you have so much talent, I can’t wait to see how this turns out. I love the elephant but I need to make a smaller version – any recommendations? Hi Robin. If you want to use my pattern for your elephant but you don’t want to increase the size as much as I did, just use smaller squares in the grid you use. I used 2″ squares, which created an elephant about 30″ high. She now weights about 40 pounds, which is a very big baby. If you want, you can make a small elephant using the pattern just as it comes out of the printer, or make one 15″ high using 1″ squares in your grid. Does that make sense? I’m not sure if everyone has used a grid to transfer a drawing from one size to another – if I should put up a post explaining it more clearly, please let me know. I want to build an alligator out of paper mache. I have been searching the web looking for ideas for making the frame. I guess I just need to jump in and get started. I am thinking large 16 oz plastic bups for the legs, they need to graduate up. Perhaps chicken wire for the body but it is so mean to work with, scratches you and such, any other suggestions? Hi Penny. What a great project! I agree that chicken wire is mean – I always end up with puncture wounds and scratches everywhere, so I refuse to use it. I don’t know how big your alligator is going to be, but if I was making one lifesized I’d cut an alligator shape out of plywood or heavy cardboard, like the elephant armature, but I would draw the shape from the top, rather than the side. The legs bend too much for plywood to go inside, but heavy cardboard would work – and I’d make the leg shapes go all the way across the back of the ‘gator so there would be a lot of surface for attachment. Then start adding crumpled paper, squashed well so it creates a good solid base for your paper mache, and keep adding it and taping it with masking tape until you have your alligator. Of course, this is the way I make all my animal sculptures. Other people prefer other methods, like chicken wire or balloons, etc., but I like doing it this way because you have the solid paper under your paper mache skin, which helps support it. Check out the paper mache tutorials page – you’ll find all the techniques I use. Then play around and experiment, and come up with some techniques of your own. And be sure to let us see your alligator when it’s finished! Good luck. I’m in awe of your creativity!!! Oh, that’s coming along so nicely! It looks like you have managed to turn the head and give some wave to the trunk and tail. Cool! I can see the thick skin wrinkles building up in various areas. I can’t wait to see its next stages! The one thing I’m most frustrated with is the need to keep all four feet on the ground. So far the only sculptures I’ve done with a base are small – the dragon and the calf. Without a base, the movement of an animal is very limited, because in nature they often have only two feet on the ground – but a two-footed sculpture would instantly fall over if those feet are not connected to something. While I worked on the elephant I kept having fantasies of him running, or sitting up, or doing something silly, but he still stood there, solid as a rock. So my next sculpture will be placed on a base. It will be interesting to see how that affects the evolution of my work. And yes, it was fun to put those wrinkles on the elephant’s britches. Hm, yeah, that’s tough. Historically, poses like that have been supported with otherwise gratuitous tree stumps or grass clumps, or drapery. I suppose you could work out something like that. Or counterweighting. But the base is probably the most stable idea. I can’t wait to see your dog. If you send me an email when your post is done, I’ll put up a special post on my blog and point to it. I know we’ll all learn a great deal from seeing your project. Hey everyone, click here to see Xan’s new dog sculpture.